Ever since Disney inexplicably received a billion dollar return on Tim Burton’s painfully dull reimagining of “Alice in Wonderland,” remakes of fairy tales with a modern sensibility have been all the rage. In the ensuing four years, audiences have been treated to retellings of “Little Red Riding Hood,” “Snow White” (two in one year), “Jack and the Beanstalk” and half a dozen others, along with the countless classic stories repurposed for NBC’s “Grimm” and ABC’s “Once Upon a Time” and its spinoff. The punchline is that the original versions of these tales, especially the ones written/collected by the Brothers Grimm, were already dark and horrifying, featuring enough death, mutilation and unhappy endings to turn studio executives and test audiences pale with anxiety. These new versions, by comparison, are about as dark as the lighting in your average Hot Topic outlet. Still, if you must remake a classic Disney movie from the perspective of the villain, you could choose worse than “Sleeping Beauty.” The 1959 film features a heroine that, even more than Cinderella, acts as a complete cipher to her own story, passed around like a chess piece between her regal parents, her fairy guardians, and the evil-doers who wish to kill her (for reasons that are never made clear). Maleficent, on the other hand, is a towering, unforgettable presence, a horned demon/witch/regent (again, not made very clear) invoking dark magic to crush her enemies at every turn. “Maleficent,” naturally, begins by recontextualizing the story, into that of a young fairy girl (played in a very nice performance by newcomer Isobelle Molloy), living in an enchanted land called The Moors, who meets and falls in love with Stefan, a human boy from the neighboring kingdom. As a war heats up between the humans and the fairies, the boy and Maleficent fight on opposite sides, leading to a monstrous betrayal on his part. Now crowned king of the land, Stefan (played as an adult by Sharlto Copley) must try to protect his daughter from the vengeful Maleficent (Angelina Jolie). It’s not a bad story, but a to establish a fresh context like this takes time, and “Maleficent” barely gives us 20 minutes of world-building before throwing us into the already-known “Sleeping Beauty” plot. In one of many curious choices, “Maleficent,” despite establishing fairly just reasons for the character’s heretofore unexplained rage at the royal family, sands down her vengeance to a more palatable level: rather than trying to kill Princess Aurora on her 16th birthday and being stopped by the three good fairies, Maleficent makes the curse a sleeping one herself, and even allows for the “true love’s kiss” loophole. “Maleficent is full of moments like this, meant to make the character more sympathetic and human but which instead strip her of the rage and hatred which made her such a compelling character to begin with. And it’s not like the actress playing Maleficent is not up to the task or perfectly cast. Jolie has never had the greatest range, but she is a capital M, capital S Movie Star, and she towers over everyone and everything else in the film. Long stretches of the movie, particularly in the middle act, find Maleficent watching silently over Aurora from the shadows, and Jolie brings a genuine sense of both menace and melancholy to these moments, often with only the slightest move of a hand or an eyebrow. If Michel Hazanavisius ever makes a silent film follow-up to “The Artist,” Jolie would make the perfect lead. 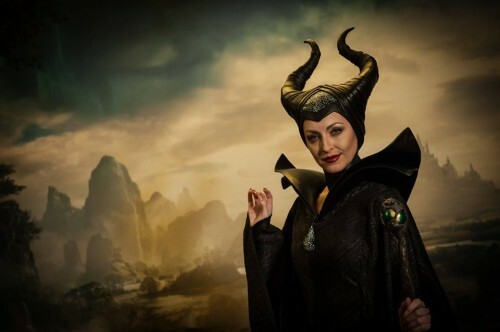 Praise also to Rick Baker’s makeup effects on Maleficent herself, as the already otherworldly Jolie is given just the right subtle touches to her eyes and cheekbones to make her an even more exotic, dangerous beauty. It’s too bad that the rest of the movie’s creatures are rendered in mediocre CGI. Unfortunately, no one else is given even the slightest chance to compete with Maleficent. Elle Fanning has done fine work elsewhere, and she is a naturally radiant onscreen presence, but her Aurora is unfortunately no more of an active participant in her own story than she was back in the 50s (with all the scenes changed in this version, they couldn’t have come up with a better way for the curse to take hold than having her zombie-walk towards the spinning wheel?). But the biggest disappointment has to be Copley. A live wire in “District 9” and even the ridiculous “A-Team” remake, his Stefan is strangely muted here, even as his character descends into paranoid madness, becoming a Howard Hughes-like shut-in and forsaking his kingdom and wife (who, amusingly, still doesn’t merit getting a name) in his thirst to finish off Maleficent. As the movie speeds towards its requisite climax, the changes in the story transition from curious and dispiriting to out-and-out irritating. Not only is Maleficent stripped of her most infamous line (“and all the powers of HELL!! !”), but her most iconic transformation is transitioned away from her and onto a male character! When a 55-year-old children’s movie made at the height of the Hays Code feels simultaneously more dangerous and more female-friendly than a supposedly modern retelling, something has gone terribly wrong. The movie presents a lot of clipped-wing metaphors for Maleficent the character. It’s unfortunate that they are so apt for “Maleficent” the film.